The shield is a representation of the traditional American shield as well as a symbol of our national heritage and allegiance. The small triangle is the Olympic trademark which also represents the goal of our training harmonious development and strengthening of body, mind and spirit. The L represents loyalty as well as love of God and all beings. The F stands for friendship, fraternity and fellowship with others. The S represents service, sportsmanship and the concept of building a spiritual harmony among all our members. 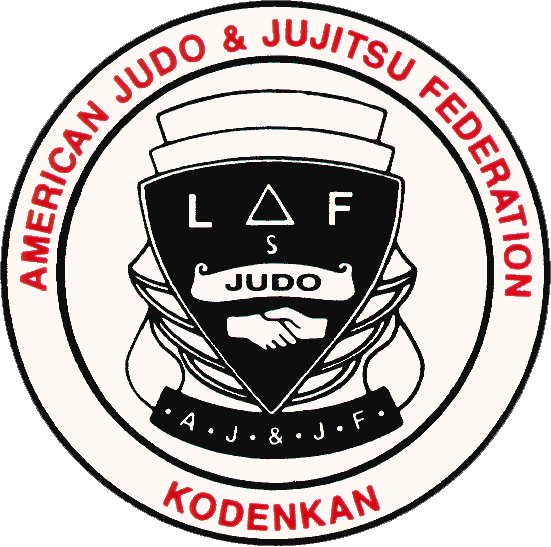 Since the fundamental principles acquired through the practice of Jujitsu have been elevated to a finder moral concept called Judo, the “Way of Gentleness”, it may well be said that the primary objective of practicing Judo is Perfection of Character. The handshake is a universal symbol of friendship and good will. This symbol accurately describes the spirit that our Founder, Professor Okazaki, declared was inherent in the Hawaiian word kokua — to help one another.